A daily assembly is held in school and includes Collective Worship. Our act of Collective Worship is Christian in its approach and is designed to be relevant, interesting and inspiring to engage a response from the children. We use prayer and reflection, songs and music, drama and stories and other stimuli to promote a sense of awe and wonder, giving opportunities for children to appreciate the spiritual dimension and express themselves spiritually. We have a weekly assembly where we celebrate individual achievement both in and out of school, and birthdays too. This helps to reinforce values and expectations for the children. 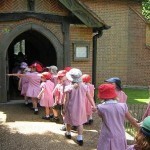 The children make use of the Church of St Saviour at Valley End, built just 6 years after the school in 1865, for curriculum and assemblies. 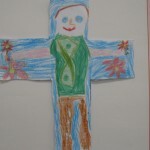 The children visit at the beginning of every term and for events such as Harvest, Christmas, Easter and Ash Wednesday. The services are conducted by the Vicar of St Saviour’s and St Lawrence Chobham. Services are also conducted in school by the Vicar, once a month. In addition we have a termly visit from ‘Engage’ – schools assembly team. If any parents have a concern about RE or assemblies they are encouraged to discuss this matter with the Headteacher, particularly if they are considering withdrawing their child from religious activity. Children withdrawn from RE will be accommodated in another class. Children withdrawn from Collective Worship will be given appropriate independent activities and will be supervised.